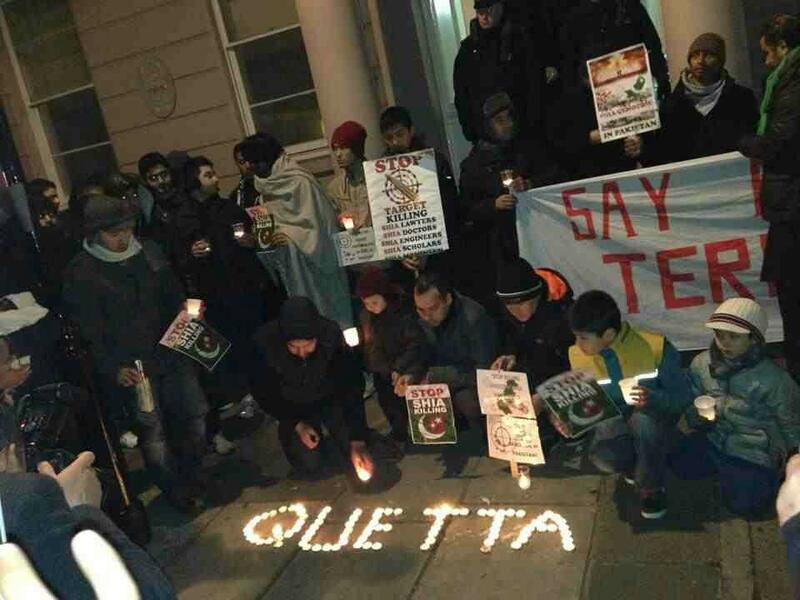 The over 60 hours sit-in protest in front of Pakistan Embassy, London, supported the leaders of Quetta Yekjehti Council, the heirs and families of victims, concluded peacefully at 6:00 AM (GMT) on Monday after the demands of the QYC were met and implemented throughout Balochistan. The followings videos exhibit the support of the London protesters. Posted in United Kingdom (General). Bookmark the permalink. 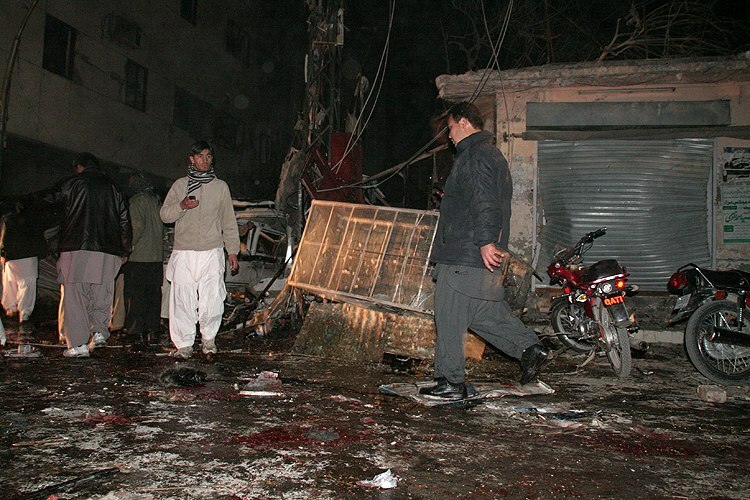 The deadly double bombing in Quetta last week left more than 86 Hazara Shia Muslims dead and hundreds injured. For over four days, the devastated men, women and children of the community sat in protest with the bodies of their loved ones in sub-zero temperatures, demanding an end to the genocide. The protests soon spread out to Islamabad, Karachi, Lahore, Peshawar and London, where a large number of Sunni and Shia Muslims sat in for 68 hours until the demands of the Quetta protesters were met. “Hazaras are under siege,” said Wajahat Ali. “Dear Pakistan, please save our men, women and children! Does anyone understand the suffering of the families of the 86 innocent people who have been killed?” he said before bursting into tears. Alongside hundreds of Shia and Sunni Muslims, the London sit-in was attended by British politicians, a delegation of the MQM, and the Pakistan High Commissioner to UK, Wajid Shamsul Hassan, to express solidarity with the target killings of the Shia community in Pakistan. 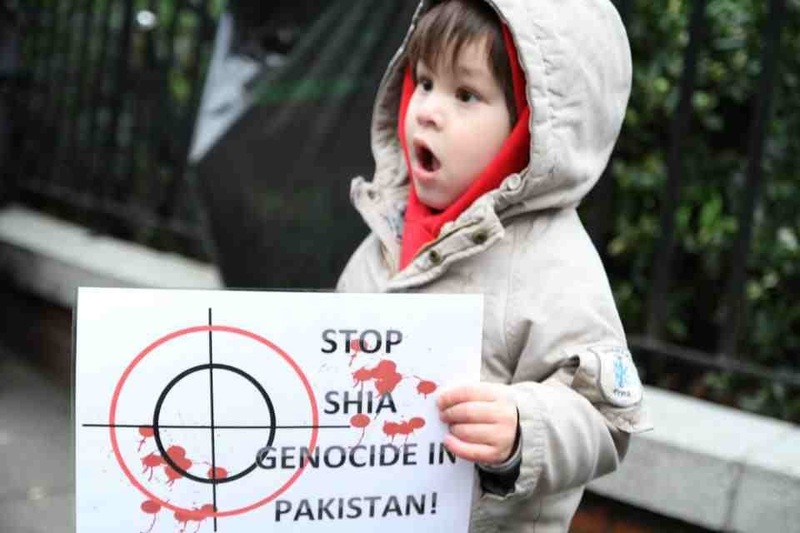 According to Amnesty International, there were more than 40 attacks on the Shia Muslims in Pakistan during the year 2012 and between four to five hundred Shia Muslims were killed across Pakistan in these attacks. “There are repeated attacks on Shia Muslims across Pakistan, certainly we believe that the government really needs to make concerted effort on an action plan on how it is going to protect the Shia Muslims,” said Polly Truscot, Director South Asian Pacific, Amnesty International. The British government also condemned the attacks on the Shia population of Pakistan, in the strongest possible words. “The United Kingdom strongly condemns these senseless attacks and the persecution of the Shia population. It was a tragic day for Pakistan said British Foreign Secretary,” said William Hague. Many at the London sit-in believed that the authorities had failed completely in tracking down the banned militant outfits who have often claimed responsibility for the attacks on Shias and Hazaras. “Sectarian outfits that are banned in the rest of the country are still operative in Balochistan without being challenged by the security forces,” said Mustafa Zaidi who spent three nights protesting at the London sit-in along with his 10-day-old baby. Many believe Pakistan’s policy of exploiting far right militant groups as a foreign policy tool was the reason behind the increasing violence in the country. According to the Hazara United Forum, nearly 1,000 Hazaras have been killed and over 2,000 injured in 120 recorded terrorist attacks in the last two years. Sunni militant group Lashkar-e-Jhangvi has claimed responsibility for most of these attacks. Hazara United Movement expresses gratitude to all supporters of the sit-in protests. The tragic suicide attack and bomb blast(s) of Alamdar Road Quetta took away over 107 innocent lives to stage a sit-in protest against the oppressed and callous Balochistan government. The movement brought a sense of agility and reawakening among all the factions of Pakistani society who stood by the families of victims regardless of creed, race, language, cultural background and religion. Hazara United Movement formally extends gratitude to the members of civil society, the Pakistani and International media, the campaigners, human rights activists, organisations of Sunni school of thought, the Christian, the Hindus, all Shi’ite organisations, men, women, children, elderly people and others who came out of their homes in frigid weather to share the sorrows of Pakistani Hazaras, support and exhibit solidarity with them. The successful completion of the protest may not have been possible without the help and support of all those who worked round the clock to remove the incapable, corrupt and unruly Balochistan provincial government. 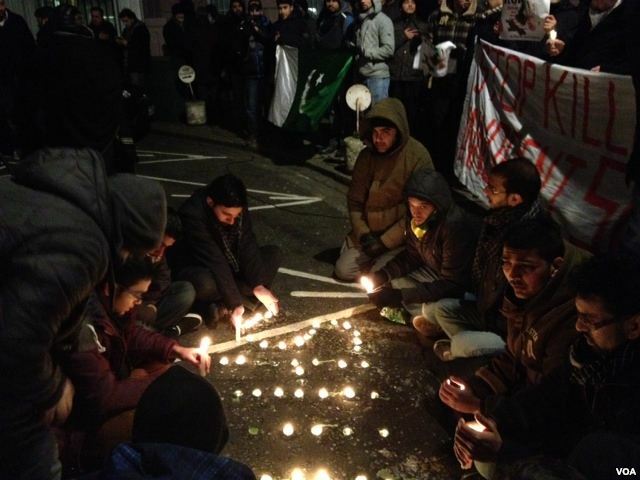 HUM feels greatly obliged of the organisations working in the UK which mobilised people to stage an immediate sit-in protest in front of the Pakistani Embassy in London in support of the Hazaras of Quetta. All the organisers, volunteers, contributors, brothers, sisters, men, women, children especially those who participated in the sit-in protest with their 10 days and a few months old babies have demonstrated unparalleled support and sympathy with the victims and their families. The Pakistani Hazaras should take internal security in own hands. Hazara United Movement strongly condemns the yesterday’s bomb blasts of Meezan Chowk and Alamdar Road which engulfed the lives of more than 100 innocent people and injuring over hundred others. The Federal and the Provincial Governments are held responsible for these attacks who have miserably failed to protect the lives and property of the people. The recent incidents of targeted killings of Hazaras in Quetta, Khuzdar and Mach etc of Balochistan province exemplify that the elements of intelligence agencies, law enforcement agencies as well as the Balochistan Provincial Government are covertly supporting the handful of terrorists to further escalate tension in Quetta. In the wake of the unabated attacks on Hazaras’ lives, it has been learnt that thousands of Hazaras who had been living peacefully in Mach, Bolan District for decades are now forcibly driven out of their properties to leave the country. The unconstitutional Balochistan Provincial Government, Chief Minister Aslam Raisani and his cabinet members are held responsible for this massive human displacement. Quetta has been turned into a battlefield through a series of bomb blasts and repeated incidents of targeted attacks which demands for strict security measures of their own. The Pakistani Hazaras must take serious steps to formulating a strategy which can address the challenges of internal security system. The threats and press statements of banned terrorists organisations including the Lashker-e-Jhangvi etc are being published on local and national dailies with impunity which are mockery of the Apex Court’s preceding directives banning publication and news/media coverage of such activities of the terrorists. The Chief Justice of Pakistan and the Chief Justice Balochistan High Court are requested to take Suo Motu action against the media groups and their owners who equally contribute to glorify terrorism and sectarianism in the country. Hazara United Movement is extremely saddened over recent bomb blasts of Meezan Chowk and Alamdar Road extending its sincerest condolences to the aggrieved families and praying for rapid recovery of the injured ones.